31 Comments | Leave a Comment.. There are currently two high profile RIAA lawsuits taking place. One of them involves a Harvard professor and the other involves Jammie Thomas-Rasset. Now the lawyers in both cases are forming a partnership to file a class-action lawsuit against the RIAA to get back the $100 million that they claim the recording industry stole. Kiwi Camara represents Jammie Thomas-Rasset in a lawsuit that the RIAA filed against her. There is a retrial taking place in Minnesota next week. Harvard Law professor Charles Nesson is representing Boston student Joel Tenenbaum in an RIAA trial as well. Kiwi and Charles are the ones getting together to file the $100 million class action lawsuit against the RIAA. Camara did an interview with Ars Technica earlier this week and revealed two pieces of evidence that will help his case. MediaSentry was hired by the RIAA to track down the IP address of those who share files. Camara is arguing that MediaSentry is not licensed as a private investigator in Minnesota. This makes them running an illegal “pen register” and their evidence should be barred. Another approach that Camara is considering is making the RIAA prove that they own the copyrights in question. If the RIAA or MediaSentry cannot prove any of the above scenarios, then the cases will fall apart for them. Camara’s approach is quite unorthodox. Camara said that the RIAA basically committed a “technical screw-up” when it came to claiming the proper copyright ownership. The RIAA lawyers provided courts with “true and correct” copies of the evidence, but they were not “certified copies” required by federal rules of evidence. The RIAA asked the judge to take judicial notice for these claims, but the judge refused. The recording industry will now have a limited amount of time to file for the certified copies. Camara already has rebuttals in mind just in case the RIAA is able to get all of the certified copies necessary for the case. More news on the trial as it develops. Kudos to Ars Technica for their thorough coverage of this case. "I doubt that every download is lost revenue, since people who download more also buy more music"
You are killing our creative industries. "Downloading costs billions," said the Sun. "MORE than 7 million Brits use illegal downloading sites that cost the economy billions of pounds, government advisers said today. Researchers found more than a million people using a download site in ONE day and estimated that in a year they would use £120bn worth of material." That's about a tenth of our GDP. No wonder the Daily Mail was worried too: "The network had 1.3 million users sharing files online at midday on a weekday. If each of those downloaded just one file per day, this would amount to 4.73bn items being consumed for free every year." Now I am always suspicious of this industry, because they have produced a lot of dodgy figures over the years. I also doubt that every download is lost revenue since, for example, people who download more also buy more music. I'd like more details. So where do these notions of so many billions in lost revenue come from? I found the original report. It was written by some academics you can hire in a unit at UCL called Ciber, the Centre for Information Behaviour and the Evaluation of Research (which "seeks to inform by countering idle speculation and uninformed opinion with the facts"). The report was commissioned by a government body called Sabip, the Strategic Advisory Board for Intellectual Property. On the billions lost it says: "Estimates as to the overall lost revenues if we include all creative industries whose products can be copied digitally, or counterfeited, reach £10bn (IP rights, 2004), conservatively, as our figure is from 2004, and a loss of 4,000 jobs." What is the origin of this conservative figure? I hunted down the full Ciber documents, found the references section, and followed the web link, which led to a 2004 press release from a private legal firm called Rouse who specialise in intellectual property law. This press release was not about the £10bn figure. It was, in fact, a one-page document, which simply welcomed the government setting up an intellectual property theft strategy. In a short section headed "background", among five other points, it says: "Rights owners have estimated that last year alone counterfeiting and piracy cost the UK economy £10bn and 4,000 jobs." An industry estimate, as an aside, in a press release. Genius. But what about all these other figures in the media coverage? Lots of it revolved around the figure of 4.73bn items downloaded each year, worth £120bn. This means each downloaded item, software, movie, mp3, ebook, is worth about £25. This already seems rather high. I am not an economist, but to me, for example, an appropriate comparator for someone who downloads a film to watch it once might be the rental value, not the sale value. In any case, that's £175 a week or £8,750 a year potentially not being spent by millions of people. Is this really lost revenue for the economy, as reported in the press? Plenty will have been schoolkids, or students, and even if not, that's still about a third of the average UK wage. Before tax. Oh, but the figures were wrong: it was actually 473m items and £12bn (so the item value was still £25) but the wrong figures were in the original executive summary, and the press release. They changed them quietly, after the errors were pointed out by a BBC journalist. I asked what steps they took to notify journalists of their error, which exaggerated their findings by a factor of 10 and were reported around the world. Sabip refused to answer questions in emails, insisted on a phone call, told me that they had taken steps but wouldn't say what and explained something about how they couldn't be held responsible for lazy journalism, then, bizarrely, after 10 minutes, tried to tell me retrospectively that the call was off the record. I think it's OK to be confused and disappointed by this. Like I said: as far as I'm concerned, everything from this industry is false, until proven otherwise. I was lucky enough to catch Larry Lessig's talk "Copyright Wars," at the Sophiensaele on my last night in Berlin. It was sponsored by the Heinrich Boll Foundation. I finally got a chance to watch this great documentary on my flight home from Berlin yesterday -- perfectly fitting after participating in the ECLA State of the World Week conference on the Politics of Cultural Ownership, and then catching the surprise talk by Lessig at the Sophiensaele along with some of "my" students on my last night in town. 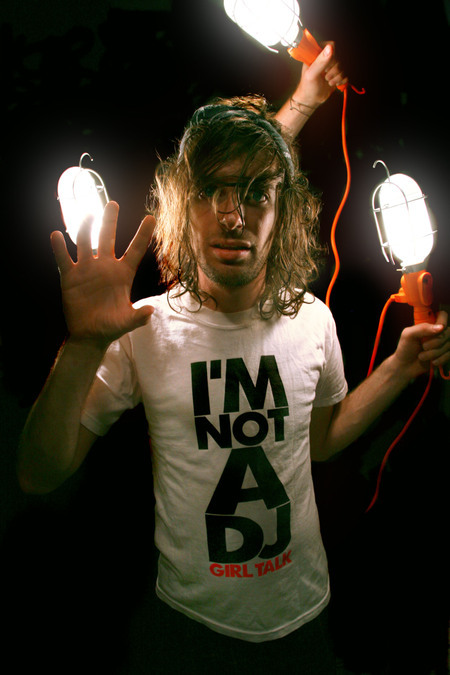 When it comes to remix culture, copyfight and crowd-sourcing, Brett Gaylor walks the walk. 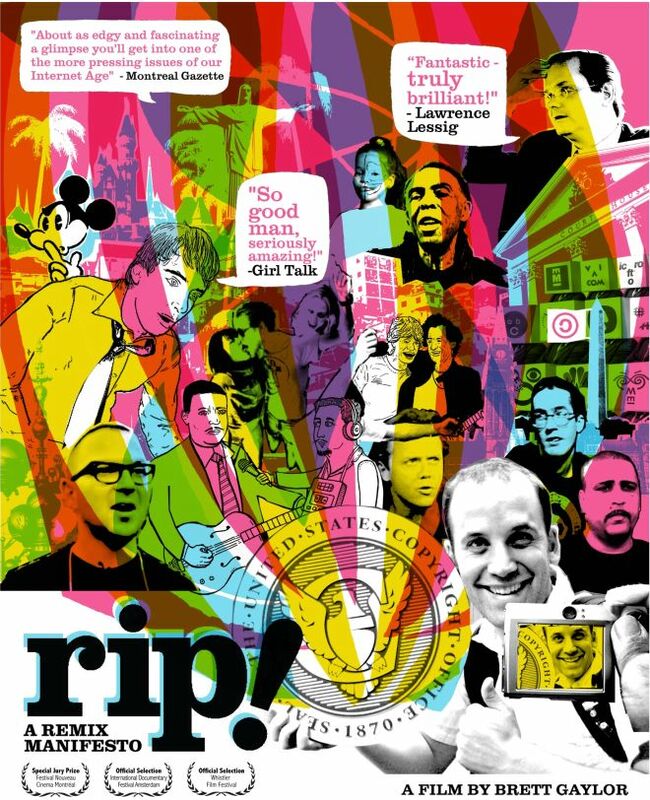 The director of “open source documentary” RiP: A Remix Manifesto released his feature-length film under a Creative Commons license and even adopted Radiohead’s name-your-own-price business model when he made the movie available online. Featuring mashup artist Girl Talk and luminaries like Lawrence Lessig, Gilberto Gil and Cory Doctorow, RiP: A Remix Manifesto debuted in Amsterdam and Canada last year and in North America last month. It opens theatrically Friday in New York. 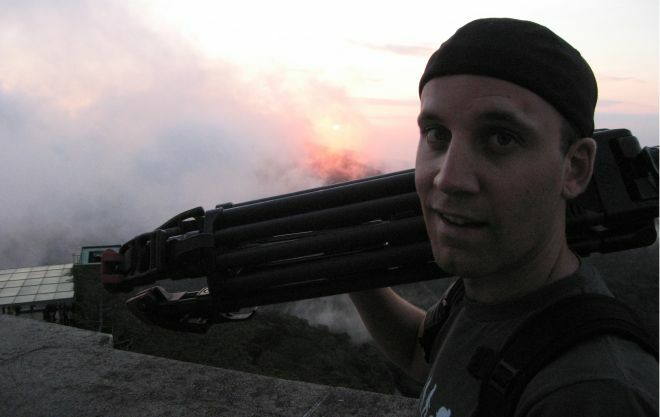 The movie’s compelling analysis of sampling, sharing and copyfighting was pieced together over six years, during which Gaylor shared his raw footage with other filmmakers, some of whose remixes he spliced into the film. Given the realities of remix culture, where there is no such thing as a final cut, Gaylor subsequently offered the movie online as a remix experiment at Open Source Cinema, which he founded and beta-launched in 2004. Since then, the little doc that could has nabbed awards, screened at panels and walked the tightrope between theatrical and internet distribution, original art and open-sourced amalgam, without falling off. Gaylor talks about copyfight crusaders, the trials and tribulations of the distribution war, and the joys of messing with the media. Brett Gaylor: It’s been a peculiar road to get to the point where we could release the film as a download, because obviously this is something we wanted to do right from the get go. But since we have so many partners that helped us make the film, including theatrical and television distributors, it was a delicate balancing act to make sure the good faith they showed in making the film would be rewarded, that we wouldn’t undercut their efforts to promote and recoup on the film by giving it away. So we waited a while before launching the various online permutations. The National Film Board [of Canada] put up a chaptered version during our U.S. premiere at South by Southwest in March, and we embedded calls to action into each chapter. Around SXSW, we partnered with two American partners — Disinformation for our DVD release, and BSide for the theatrical side of things. And at the first meeting I had with them, it became clear that we needed to go down this road. We knew the film would appear on file-sharing networks immediately and we knew the audience for the film wanted and expected it to be online. So knowing that, we wanted there to be a method for those who wanted to pay to do so. Wired.com: Are you satisfied with the arrangement so far? Gaylor: It’s still not moving as fast as I’d ultimately like. The pay-what-you-can is at the moment just available for those in the U.S., while some of the other world territories do their thing theatrically or on DVD. And we, being the National Film Board of Canada, and our production company EyeSteelFilm, want those territories to be able to have a chance to define their own business model, so it’s fair. Its been a lot of tricky e-mails. Wired.com: How has the theatrical run gone, and how are you feeling about the New York City opening? Gaylor: The theatrical run so far has been amazing. In Canada, it played literally coast to coast, and there is something immensely satisfying as a filmmaker to see your film’s title on a marquee and have people watch it together on a big screen. We went to a lot of lengths for it to work well in that format; it’s got big sound, beautiful graphics and animation, and the cinematographer Mark Ellam did an amazing job. It’s also really challenging to engage the public in theaters, because you’re playing your film to this broad demographic. We had people in the lineups at the AMC trying to decide if they’d go see Benjamin Button or this crazy copyright remix movie, so that was a surreal pleasure. It also generated a ton of press for the film, mostly great, but the film enraged the right-wing papers in the country who took a lot of umbrage with its central themes. 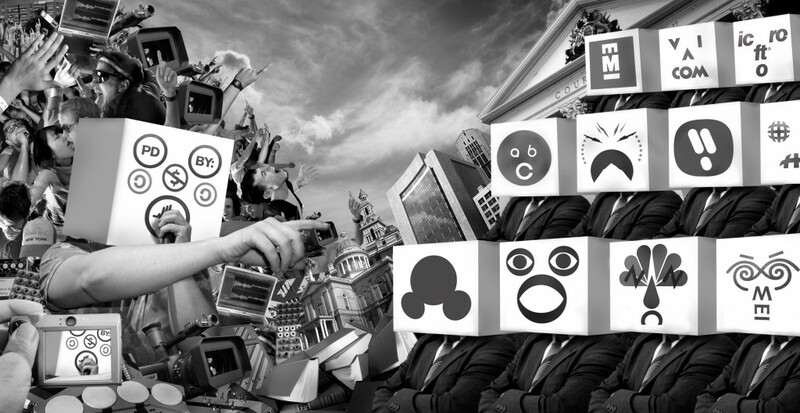 Battle lines over free culture are drawn in this RiP collage, entitled Copyright vs. Copyleft. Wired.com: Tell us about the New York screening, which coincides with a panel from the Open Video Alliance about standards and practices. Gaylor: We’re doing a sneak preview on Friday and then following up with the launch at the Open Video Conference, which I’m extremely excited to participate in. I was part of the initial planning sessions for this group back in the fall, and it really feels like a culmination of all this disparate work that has been going on in the free culture world for years. Filmmakers, free software geeks, remixers, lawyers, academics — all these different people who have been working on these parallel tracks are starting to feed their work into one another, and I find it incredibly inspiring. So it will be an honor to show the film there. It’s a tough crowd, too! Wired.com: Talk about working with Girl Talk’s Gregg Gillis and Negativland’s Mark Hosler on this film and its various openings. What role have both played in the evolution of remix culture? Gaylor: Working with Gregg was a lot of fun. One of the reasons I wanted to include him in the film is because he doesn’t see himself as a copyright crusader. He’s a serious musician whose work points out a lot of flaws, contradictions and challenges in current copyright law. The fact that he’s been able to reach such a level of success without a lawsuit has created a lot of elbow room for musicians. Wired.com: How about Lessig and Doctorow? Wired.com: You’ve said in your blog that “theatrical distribution is a war.” Can you elaborate? And what does internet distribution, legal and otherwise, offer in terms of an olive branch? Gaylor: It’s a war in that you have to do so much to get the proverbial butts in the seats. It’s extremely costly and the stakes are high, whereas I think the internet gives some opportunities to speak directly to an audience. With RiP, we tried to have the best of both worlds. It was important that folks who weren’t exposed to these issues were able to see it, but we also wanted to try and lower the friction as much as possible to those who were active online and who would really see themselves in the film. Wired.com: Now that you’ve made a film on these issues, has your mind changed about intellectual property or ownership? What’s the tightrope there? Gaylor: The classic copyright ones: Providing an incentive, while at the same time ensuring the public’s access to the work. Ultimately, that’s what I, and most people in this movement, are pushing for — a balance. So the film release was a lot more “free as in speech” than it was “free as in beer,” because it was important for me that average folks could see the film on TV or in theaters. And eventually, after a limited term (measured in months! ), the film will fall into the public/pirate domain and be copied freely. Wired.com: Do you envision a day when theatrical distribution is a dinosaur, and we’re all paying to stream films online? Gaylor: We’ll see how I feel about that in a year. The remixing is just starting to take off, and I envision a time when these sorts of interactions will create an environment where a theatrical screening is to filmmakers what live performances are to musicians. The ability to create something unique for a particular screening or event allows you to offer an added value to that audience member, as well as have something unique that’s different from what you can get on a DVD or online. The moment Lessig's new book, Remix: Making Art and Commerce Thrive in the Hybrid Economy, finally arrived in the mail, someone I know grabbed it (!) and I may just have to wait til he's finished to grab it back. It was a tough morning swallowing Spencer's review. My reaction was -- "really, that's what you see in the book?!" None of the key points that made it worth my writing the book were visible to him (or at least, as evinced by the review). And that, frankly, was astonishing, and astonishingly depressing. "What does it mean to society when a whole generation is raised as criminals?" This is the question that intellectual property guru and "copyleft" leader Lawrence Lessig asks in his new book, Remix. He's building on a point he first raised in his influential volume Free Culture: if we are going to declare a "war on piracy," we need to be prepared for collateral damage. The blowback that Lessig explored in Free Culture was felt by traditional U.S. culture, with its modes of open exchange (libraries distributing books, for instance, as well as teenagers making mix tapes) and its reliance on a growing public domain to spur creativity. In this book, Lessig identifies victims even closer to home: our children. "How," Lessig asks, is the war on piracy "changing how they think about normal, right-thinking behavior?" The creative practices of today's youth include a range of activities -- file sharing, most notoriously, but also the production of mashups -- that are illegal under the current copyright regime, but criminalization is having little success as a deterrent. Instead, the focus on "piracy" is changing our relationship to the law itself, which has come to seem arbitrary and unfair, and it's hampering creative and educational uses of new technologies. It's time to consider, Lessig argues, whether the costs of this war are too high. As recently as 100 years ago, the majority of the music that Americans heard was that which they made themselves, or which others around them made. Prior to the popularization of the player piano, followed by the gramophone and the radio, music had to be performed live, and for that reason, an amateur culture of music making flourished. The spread of technologies for the recording and playback of music thus didn't democratize music itself but rather the ability of the masses to hear professionals play. The end result, as Lessig points out, was in fact highly anti-democratic, replacing an amateur culture with a professional culture and transforming much of the populace from producers into consumers. As music (along with other artistic practices) became increasingly professionalized, it also became increasingly subject to ideas of ownership, with the result that amateur uses of music's professional products became increasingly restricted. However, many of those amateur uses of professional culture were restricted throughout the 20th century, not just by legislation but also by the scarcity and cost of the technologies involved. Since few people had access to recording facilities, for instance, the unauthorized reproduction of music was a fairly limited affair. What copyright controlled, for much of its existence, was thus the professional reproduction of cultural texts -- usually in the form of books and other printed matter -- and copyright law was understood to restrict publishers from releasing competing versions of texts, rather than restricting consumers in their uses of those texts. The situation has of course changed, and changed radically, in the age of the computer, as the technologies of cultural production are available on an increasing number of desktops throughout the country. On the positive side, this change has the potential to transform a professionalized, read-only culture back into a widespread amateur read-write culture. 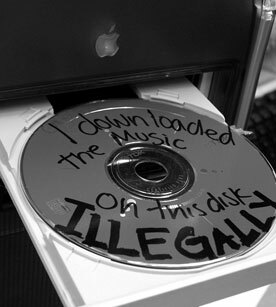 On the negative side, however, computer technologies have caused the jurisdiction of copyright law to spread from producers to consumers and thereby increasingly restrict the uses we can make of the culture we participate in.